This entry was posted on Monday, November 24th, 2008 at 1:19 pm and is filed under Uncategorized. You can follow any responses to this entry through the RSS 2.0 feed. You can leave a response, or trackback from your own site. 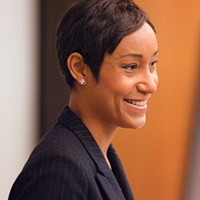 Desiree is most notable in CHI as the President of Peoples Gas and North Shore Gas. She is an amazing leader, and trusted figure in Chicago business. Glad you recognized her in your blog. This is a great ‘ first’. I’m tickled to pieces about it. Thanks for this info MBC, III. Congrats to Ms. Rogers – she appears to be an excellent choice.